Throughout human history, light is one of the most important and interesting topics to look into. Spiritually, following the light of the world allows us to not walk in the darkness. In practice, light is so useful. I cannot imagine what our life would be like without light. Early humans learned how to control fire millions of years ago, and thanks to the light from fire, people can party at night. Millions of years later, people gained some knowledge about electricity, so Edison could patent the first commercially successful light bulb in the year of 1897. Ever since then, we do not need to burn things to get light. With the development of science and technology, the first visible spectrum LED was developed in 1962, and soon engineers found ways to increase the brightness and to reduce the cost of LEDs. In the 90s, sneakers with LEDs on them were invented. I remember when I was a kid I always wanted a pair of these kinds of shoes, but I did not get them since they were much more expensive than the normal ones. Well, I guess it was not always easy to convince my parents that having LEDs on shoes was important to me when I was a small kid. Now we have grown up and with a little bit more money in our pockets, it is possible for us to at least get some LED computer parts. In today’s review, we will take a look at the computer cooling fan with LEDs, the Reeven Kiran RGB fan. Can today’s review unit be considered as a good choice to make our computer case cool again? Let us read on and find out! 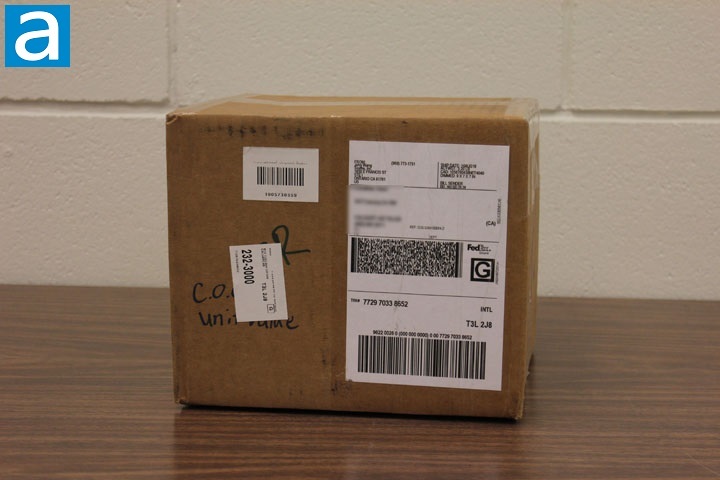 Today’s review unit was shipped to us here in Calgary, Alberta, Canada via FedEx Ground from the Reeven North America office in Ontario, California, USA. The shipping box was a little bit too big for just three cooling fans. In fact, there was one big CPU cooler from Reeven as well. The CPU cooler, the Reeven Ouranos RC-1401, was reviewed by me a few weeks ago. Although you may see small dents by the corners of the parcel, there was actually no sign of unacceptable damage on the shipping box itself that could make you nervous about the safety of the product -- well done FedEx. Taking all three fans out of the shipping parcel and putting them on the table is quite an enjoyable sight. The background color of the retail package is black, and it provides a good contrast to the fan's photo. Just by glancing at the packages, the first thing that catches my eye are the fan's RGB effect. There is also a RGB label printed on the top-left corner of the retail package. It is not hard for a customer to notice this is a RGB cooling fan. On the bottom of the package front cover is the Reeven company logo. 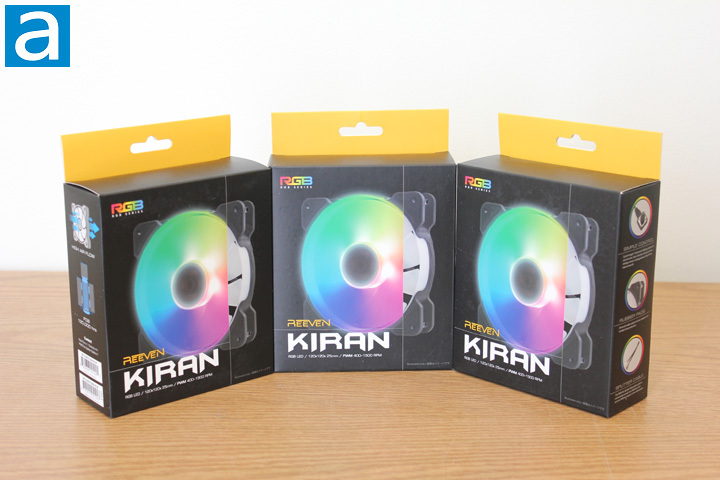 The product model name Kiran is printed below the company logo. Flipping the retail box over, there are several RGB effect examples of the product. Overall speaking, the package design is pretty good in my opinion, since you can spot all the useful information like the RGB features, size, and looks of the fan fairly easily. After taking the fans out of the retail boxes, you will see the fan, a plastic bag of four screws, a PWM fan splitter cable, and a user manual. 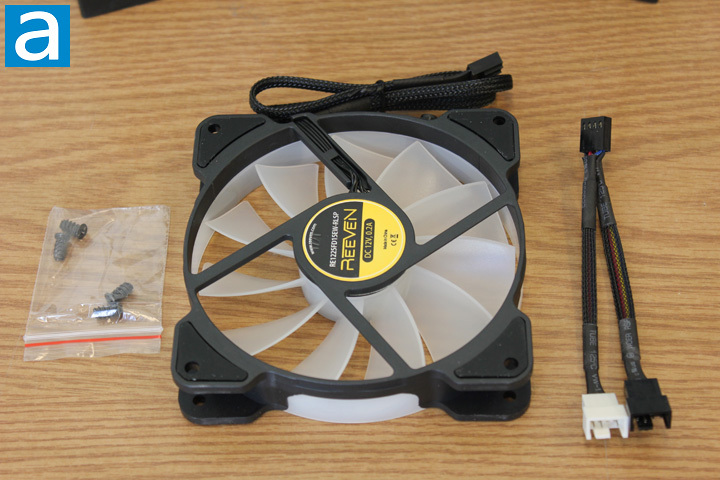 In the above picture, the 120 mm Reeven Kiran fan and all the accessories are shown. It is hard to tell how long the cable is, since it is folded in the above photo. According to the specifications, the length of the cable is 50 cm. According to my experience, it should allow you to easily install the fan anywhere in a standard sized mid tower computer case. The cable of the Reeven Kiran is protected by a braided coat, which is a very useful design since the soft rubber of the cable will not be damaged by any sharp edges in your computer case. At the end of the cable, the fan has a 4-pin PWM connection, which means their speed is adjusted by your motherboard using pulses of voltage. The use of PWM allows the fan to spin slowly when the computer is idle. Since noise level is proportional to the RPM, that is, the higher the RPM, the higher the noise level, the fan can be pretty quiet when it is not at full load.